Long-term coculture models of hepatocytes are promising tools to study drug transport, clearance, and hepatoxicity. In this report we compare the basal expression of drug disposition genes and the inductive response of prototypical inducers (rifampin, phenobarbital, phenytoin) in hepatocyte two-dimensional monocultures and the long-term coculture model (HepatoPac). All the inducers used in the study increased the expression and activity of CYP3A4, CYP2B6 and CYP2C enzymes in the HepatoPac cultures. The coculture model showed a consistent and higher induction of CYP2C enzymes compared with the monocultures. The EC50 of rifampin for CYP3A4 and CYP2C9 was up to 10-fold lower in HepatoPac than the monocultures. The EC50 of rifampin calculated from the clinical drug interaction studies correlated well with the EC50 observed in the HepatoPac cultures. Owing to the long-term stability of the HepatoPac cultures, we were able to directly measure a half-life (t1/2) for both CYP3A4 and CYP2B6 using the depletion kinetics of mRNA and functional activity. The t1/2 for CYP3A4 mRNA was 26 hours and that for the functional protein was 49 hours. The t1/2 of CYP2B6 was 38 hours (mRNA) and 68 hours (activity), which is longer than CYP3A4 and shows the differential turnover of these two proteins. This is the first study to our knowledge to report the turnover rate of CYP2B6 in human hepatocytes. The data presented here demonstrate that the HepatoPac cultures have the potential to be used in long-term culture to mimic complex clinical scenarios. The current landscape of in vitro models for predicting induction relies on primary human hepatocytes in conventional monoculture layers without an overlay [two-dimensional (2D)] or in a sandwich-culture format. Several publications have highlighted the utility of 2D or sandwich-cultured models using cryopreserved human hepatocytes to assess the CYP3A4-induction–based drug-drug interaction (DDI) risk of new chemical entities (NCEs) by conducting retrospective analyses on compounds that are known to be CYP3A4 inducers or noninducers in the clinic (Fahmi et al., 2010; Einolf et al., 2014; Zhang et al., 2014). Although these models have proven to be invaluable in understanding the CYP3A4-induction–based DDI risk of NCEs in both a practical and cost-effective way, the 2D substratum forces hepatocytes to alter their cytoskeleton toward a flattened morphology (Buxboim et al., 2010). This change in cell shape and form limits cell–cell and cell–matrix interactions that consequently leads to reduced polarization, reduced bile canaliculi formation, and a loss of important signaling pathways necessary for normal hepatocyte function (Berthiaume et al., 1996). Not surprisingly, hepatocytes cultured in this manner remain viable for only 4–5 days and rapidly deviate from their differentiated phenotype (Gómez-Lechón et al., 1998). In addition to CYP3A4, it is also important to identify in vitro systems for the evaluation of CYP2C induction. In a recent publication by Yajima et al. (2014), in which the standard 2D hepatocyte culture model was used, of the eight hepatocyte lots treated with rifampin, CYP2C8 and CYP2C9 mRNA were not induced in five and two hepatocyte lots, respectively. This can be problematic given that both the European Medicines Agency and the Food and Drug Administration Regulatory Guidances now recommend that the CYP2C-induction–based DDI risk of NCEs need to be evaluated given that CYP2C comprises approximately 20% of total P450 content in human livers (Inoue et al., 1994) and that CYP2Cs are responsible for metabolizing approximately 20% of all prescribed drugs, including tolbutamide, phenytoin, warfarin, and ibuprofen (Goldstein, 2001). Prediction of CYP2B6 induction and inactivation is another lesser studied area in preclinical drug research. Several substrates, inhibitors, and inducers of CYP2B6 have been identified making it an important enzyme involved in DDI. Recently Zamek-Gliszczynski et al. (2014) reported that suppression of CYP2B6 by an NCE could be a potential pathway for DDI. Physiologically based pharmacokinetic (PBPK) models used for predicting these interactions rely on accurate turnover rate of CYP2B6 mRNA and protein. As the need for more predictive in vitro hepatocyte models is increasing, there is now a strong demand for technologies that maintain their differentiated in vivo-like phenotype and for a longer period of time. Several models have become available in recent years, however, the main issues are the requirement of large cell numbers, low throughput, and expensive equipment, which render these systems unattractive for the pharmaceutical industry (Bachmann et al., 2015). The HepatoPac coculture model consists of primary hepatocytes that are micropatterned to form a discrete microarchitecture or “hepatocyte islands” that are surrounded by supporting fibroblasts resulting in long-term viability and metabolic function for several weeks (Khetani and Bhatia, 2008). Many groups have been able to successfully use the HepatoPac model for metabolite profiling and improved in vitro–in vivo correlation (IVIVC) for low clearance compounds and liver toxicity studies (Wang et al., 2010; Chan et al., 2013; Trask et al., 2014). The HepatoPac model has also been successfully used for the mechanistic understanding of complex drug-drug interactions (Ramsden et al., 2014). Whereas earlier studies by Khetani and Bhatia (2008) indicated that transcription factors, such as the pregnane X receptor (PXR) and constitutive androstane receptor (CAR), together with coactivators and corepressors are maintained during the extended culture time, no studies have been reported in which a thorough evaluation has been conducted to understand the advantages and limitations of the HepatoPac model compared with the 2D-induction model. The objectives of this study were to: 1) compare differences in gene expression levels of major metabolic enzymes and transporters in the same batch of hepatocytes when cultured in the 2D conformation (monoculture) to the micropatterned cocultured system (HepatoPac); 2) compare induction of major (CYP3A4, CYP2B6, and CYP2C) metabolic enzymes between the two systems; and 3) determine the degradation rate (kdeg) of CYP3A4 and CYP2B6 in HepatoPac. Human HepatoPac cultures, proprietary hepatocyte maintenance, and induction application media were purchased from Hepregen Corporation (Medford, MA). The HepatoPac and the monocultures were prepared using cryopreserved human hepatocytes (Table 1) purchased from Life Technologies/Thermo Fisher (Grand Island, NY) or BioreclamationIVT (Baltimore, MD). Williams’ E medium, Cryopreserved hepatocyte recovery media, Hepatocyte Maintenance Supplement Pack, Hepatocyte Plating Supplement Pack were purchased from Life Technologies. Rifampin, phenytoin, phenobarbital and diclofenac sodium salt were purchased from Sigma-Aldrich (St. Louis, MO). Midazolam, 1′OH-midazolam, 4′OH-diclofenac, bupropion, hydroxybupropion and isotopically labeled internal standards ([13C6]hydroxydiclofenac, [13C3]1′-hydroxymidazolam, D6 hydroxybupropion) were purchased from BD Biosciences/Gentest (Woburn, MA). MagMAX total RNA recovery bead kits were purchased from Life Technologies. Applied Biosystems reverse transcription–polymerase chain reaction (PCR) and TaqMan real-time PCR assays were purchased from ThermoFisher Scientific (Waltham, MA). Induction-certified cryopreserved hepatocytes (Table 1) purchased from commercial vendors were used to prepare the HepatoPac cultures by Hepregen Corporation, using previously described methodology (Khetani and Bhatia, 2008). Hepatocytes were seeded at a density of 32,000 cells/well with 3T3-J2 murine embryonic fibroblasts in 24-well plates. HepatoPac cultures were maintained in proprietary media at Hepregen Corporation for 9 days post seeding prior to initiating experiments. For induction experiments, proprietary serum-free application medium supplied by Hepregen Corporation was used. The plates were cultured in an incubator with 10% CO2 and 95% relative humidity at 37°C. Cells were treated with 0.1% dimethyl sulfoxide (DMSO), rifampin, phenytoin, or phenobarbital for 72 hours. Drug-containing media was changed every 24 hours for three days. Concentration of solvent (DMSO) in the culture media did not exceed 0.1%. All experiments were performed in triplicate. Monocultures were prepared in parallel to the HepatoPac cultures, using the same lots of cryopreserved hepatocytes, in 96-well format. Cells were plated in collagen-coated plates at a density of 0.8 million viable cells per milliliter. Cells were maintained in Williams’ E medium containing Hepatocyte Maintenance Supplement Pack and 10% bovine serum for 6–8 hours before being changed to medium devoid of serum. Twenty-four hours after plating, the cells were treated with various concentrations of rifampin (0.01–10 μM), phenytoin (1–250 μM), or phenobarbital (10–1000 μM) for 72 hours. Drug-containing media was changed every 24 hours for 3 days. Concentration of solvent (DMSO) in the culture media did not exceed 0.1%. Cultures were maintained in an incubator with 5% CO2 and 95% humidity. All experiments were performed in triplicate. At the end of induction period induction meda from both cultures was removed and the cells were rinsed with either serum-free induction medium or Hanks’ balanced salt solution (HBSS). Cultures were then incubated with 15 μM midazolam, 40 μM diclofenac, or with 100 μM bupropion, all of which were dissolved in DMSO and then spiked into serum-free medium or HBSS, for 30 minutes. Total concentration of solvent in the activity assay did not exceed 0.5%. Fifty microliters of supernatant was transferred to plates containing 100 μl of acetonitrile containing [13C6]hydroxydiclofenac, [13C3]1′-hydroxymidazolam, or D6-hydroxybupropion as internal standards. Samples were stored at –20°C until further analysis. Rifampin (1μM) was incubated with 3T3 murine embryonic fibroblast cells (n = 3) at 37°C in the media used for HepatoPac-induction studies. The media was collected at 0, 1, 2, 4, 8, and 24 hours, and rifampin concentration was measured in these samples. Rifampin (1 μM) was also incubated with plated monocultured hepatocytes (n = 3) in the induction media at 4°C. Media samples were collected at 0, 1, 2, 4, 8, and 24 hours, and rifampin concentration was measured in these samples using liquid chromatography–mass spectrometry. Liquid Chromatography–Tandem Mass Spectrometry Analysis of Samples. Five-microliter aliquots of samples were injected onto a Unisol C18 column (2.1 × 30 mm, 5 μm) (Agela Technologies, Newark, DE) using a CTC Analytics PAL (LEAP) autosampler (CTC Analytics AG, Zwingen, Switzerland), and Agilent 1100 Series Binary Pumps (Agilent Technologies, Palo Alto, CA). The analytes were eluted using a gradient method with a flow rate from 0.8 to 1.8 ml/min. Mobile phase A was 10 mM ammonium acetate in water (pH 4.0) and mobile phase B was acetonitrile/methanol (50/50, v/v). The analytes, 1′-hydroxymidazolam, 4′-hydroxydiclofenac, hydroxybupropion, and rifampin, were analyzed using an API 5500 mass spectrometer (AB Sciex, Foster City, CA) in electrospray-ionization multiple-reaction-monitoring mode using the following mass transitions 342→203, 310→266, 256.2→167.2, 823.6→791.4, respectively. Isotope-labeled internal standard transitions, 345→206, 316→272, and 262.2→167.2, were used for 1′-hydroxymidazolam13C3, 4′-hydroxydiclofenac 13C6, and D6 hydroxybupropion, respectively. The peak area ratio of analyte/internal standard was used for calculations. Data were analyzed in Galileo LIMS system version 3.3 (Thermo Electric Corporation, Philadelphia, PA). The lower limit of quantitation (LLOQ) ranged from 0.0005 to 0.05 μM and the upper limit of quantitation (ULOQ) ranged from 0.2 to 2 μM, depending on analytes tested, instrument sensitivity, linear dynamic range of instrument, and analyte concentration range of samples. All analyte concentrations of tested samples are within linear range of specific testing. The back-calculated concentrations of the calibration standards are within ±30% of the nominal values. Following P450 activity measurements, the media was removed and the cells were stored in RNAlater at –20°C until RNA isolation. Total RNA was isolated from cells using the MagMAX bead-based system according to the manufacturers’ protocol (Life Technologies). The RNA concentration and quality of each sample was measured using a NanoDrop 2000 spectrophotometer. A two-step reverse transcriptase (RT)- PCR reaction was conducted by reverse transcribing 50 ng of total RNA to cDNA using TaqMan Reverse Transcription Reagents, according to the TaqMan Universal PCR Master Mix protocol. PCR reactions were then prepared by adding an aliquot of complementary DNA (cDNA) (2 μl) to a reaction mixture containing the TaqMan Fast Universal PCR Master Mix solution, primers, and probes for P450 enzymes. GAPDH was measured as a housekeeping gene and all data were normalized to the expression of GAPDH. Fold change in mRNA expression over solvent control was expressed using the ΔΔCt method. Basal Expression of Drug Disposition Genes in HepatoPac and Monocultures. Basal expression of drug metabolism genes was determined from the cDNA of DMSO-treated hepatocytes from both culture models. Microfluidic cards with assays for desired genes and endogenous controls were custom made at Life Technologies. The cards were loaded with a mixture of 50 μl of diluted cDNA and 50 μl of fast real-time PCR master mix. The cards were run according to manufacturer’s (Life Technologies) instructions on ViiA 7 real-time PCR instrument with an array block. The relative difference in gene expression between HepatoPac cultures and the monocultures was determined using comparative ΔΔCt method. GAPDH was used as the housekeeping gene in all gene expression studies. The ΔCt values from the monocultures and the HepatoPac cultures were compared using a Student’s t test to determine if the expression levels in HepatoPac are significantly different from the monocultures. Determination of kdeg and t1/2 of CYP3A4 and CYP2B6. HepatoPac cultures for three lots of hepatocytes (n = 3) were treated for 72 hours with either 0.1% DMSO or 10 μM rifampin to achieve maximal induction of message and activity. Following the 72 hours-induction period, the recovery of P450 activity and mRNA expression were measured at 0, 24, 48, 72, 96, and 144 hours. During this recovery period, the hepatocytes were maintained in 10% serum-containing medium. Fold change in activity and mRNA was calculated. The baseline value of induction (E0) was fixed to 1. Data fitting was done using Graphpad Prism 5.0 (La Jolla, CA). To determine kdeg of the CYP3A4 and CYP2B6 protein (as measured by functional activity) and mRNA, fold change was first converted to the natural log and then plotted against time (hr). The data were fitted to a linear regression model and the slope (k) of the loss of enzyme activity or mRNA was used to calculate the t1/2 using eq. (2). This t1/2 represents the degradation rate of the protein and message. Predicting Plasma Exposure of Rifampin. Pharmacokinetics of rifampin was simulated using the minimal PBPK model implemented in the Simcyp simulator (version 13; Simcyp Ltd, Sheffield, UK). The default pharmacokinetic parameters of rifampin in the Simcyp simulator used to predict its plasma exposure are presented in Supplemental Table 1. Plasma concentration profile of rifampin given at the oral dose of 5, 10, 15, 75, or 600 mg for 7 days was simulated. The predicted maximum plasma concentration (Cmax) at steady state was corrected using the protein binding of rifampin (fu = 0.15, data source: Simcyp). The observed midazolam area under the plasma-concentration time curve (AUC) change reported in Kharasch et al. (2011) and the simulated unbound Cmax of rifampin was then fitted to a nonlinear regression model using GraphPad Prism software (v6.0). 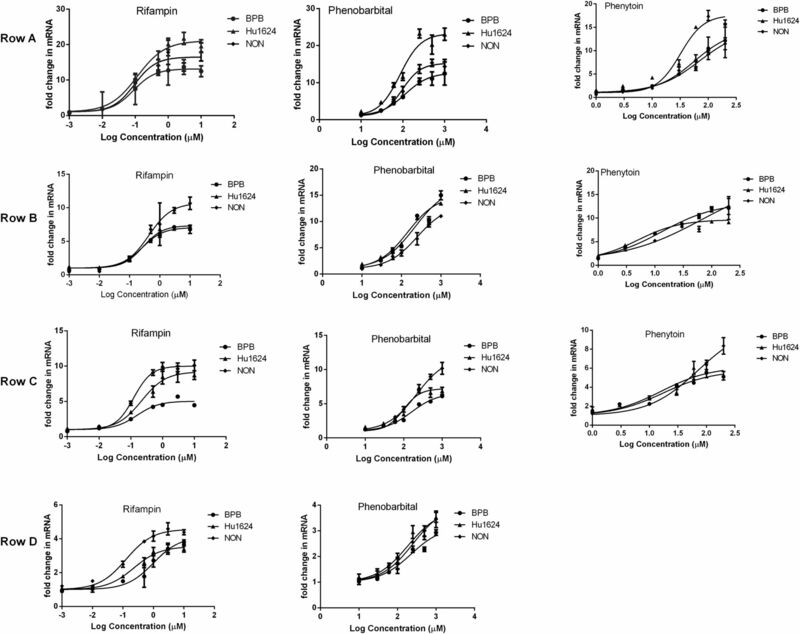 Basal Expression of Drug Metabolism Genes in the HepatoPac Model Compared with Monocultures. Expression of 76 drug-disposition genes and 4 housekeeping genes was determined in vehicle-treated cells (72 hours) from both monoculture and the HepatoPac coculture models. The HepatoPac cultures were about 12-days-old and the monocultures were 4-days-old at the time of this analysis. For the HepatoPac studies we used a 24-well format that has 30,000 hepatocytes /well as opposed to the 96-well format that has 5000 hepatocytes/well. The 24-well format ensures sufficient yield of RNA to perform gene expression studies. Comparative statistics using a t test were used to compare the data, and a P value less than 0.05 was considered significant. The P values are included in the Supplemental Table 2. Significant differences were observed between the HepatoPac model compared with monocultures of hepatocytes. As shown in Fig. 1A, expression levels of CYP3A4 in the HepatoPac model were 2- to 200-fold higher than that in the monocultures. Human donor lot BPB had the largest disparity in the expression of CYP3A4 between the two culture models. This could be attributed to the low basal expression of CYP3A4 in this donor in the monoculture model of hepatocyte induction. The expression of CYP2C9 and CYP2C19 was only 2- to 3-fold higher in the HepatoPac model in all lots; however, the expression of CYP2C8 was 4- to 22-fold higher in BPB and NON lots. Basal expression of CYP2D6, CYP2E1, UGT1A1, and SULT1B1 was significantly higher in the HepatoPac cultures than in the hepatocyte monoculture. The expression of arylacetamide deacetylase (AADAC), an enzyme responsible for the metabolism of rifampin (Nakajima et al., 2011), was also significantly higher in the HepatoPac cultures compared with the monocultures. cDNA from vehicle-treated cells from both monocultures and HepatoPac cultures of hepatocytes were used to determine the basal expression of drug disposition genes. Gene expression in HepatoPac cultures was compared with that of monocultured hepatocytes, and the data were expressed as relative change over monocultured cells. (A) Relative expression of Phase I and Phase II enzymes. (B) Relative expression of uptake and efflux transporters in three lots of hepatocytes. Data are shown as mean (S.D.) of three determinations. HepatoPac cultures also had higher expression of BSEP, MDR3, OCT1, OATP1A2, and OATP1B3 than that in the monocultured cells as shown in Fig. 1B. Significant interdonor differences were observed in the expression of some uptake transporters. OATP1B3 was 17- and 11-fold higher in NON and BPB lots, respectively. However, in the donor lot Hu1624, expression of OATP1B3 was only about 3-fold greater in the HepatoPac cultures. OCT1 expression in lots BPB and NON was >2-fold higher in HepatoPac cultures compared with the hepatocyte monocultures. MDR1 expression levels were >2-fold lower in the HepatoPac model compared with the 2D model in lots 1624 and BPB. Expression of nuclear receptors, including those implicated in inductive response by xenobiotics such as PXR, AHR (arylhydrocarbon receptor), GR (glucocorticoid receptor), and PPAR (peroxisome proliferative receptor), were not substantially different in the HepatoPac model (Supplemental Fig. 1). Expression of CAR was higher in the HepatoPac model in lot BPB but was similar to the monocultures for the other two lots. Levels of NCOR1 were higher in all three lots of the cocultured system compared with the 2D model. The expression of several drug metabolism genes was lower in the HepatoPac model than in the monoculture models (Fig. 1A). Gene targets GSTA2 as well as certain sulfotransferase genes were lower in the HepatoPac model. Efflux transporters such as BCRP, MRP4, and MRP6 were lower in the HepatoPac model in all three lots studied (Fig. 1B). 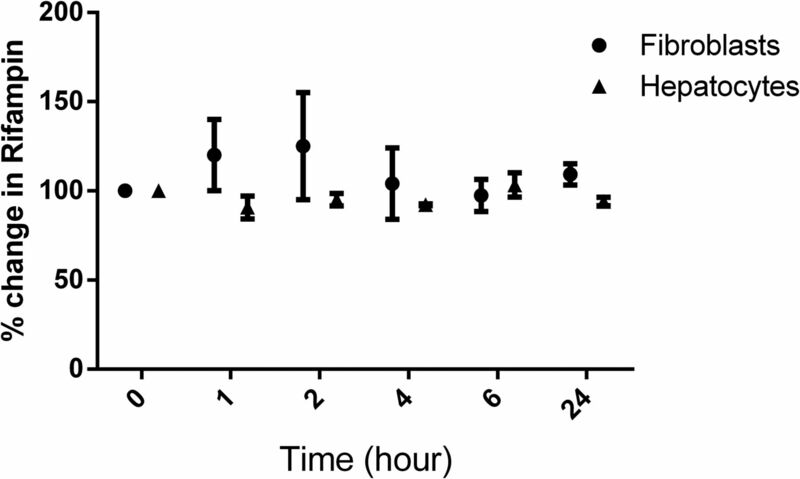 Basal Activity of CYP3A4 and CYP2B6 in HepatoPac Cultures following 72-Hour Incubation. The activity of CYP3A4 and CYP2B6 in HepatoPac was determined using midazolam and bupropion, respectively, as probe substrates, following treatment with 0.1% DMSO in serum-free media for 72 hours. After the treatment period, CYP3A4 activity was monitored over 8 days in culture in serum-containing maintenance media (Fig. 2A). Immediately after switching the cultures to serum-containing medium, the CYP3A4 activity increased about 4-fold from 0–96 hours post-treatment. The formation of hydroxymidazolam did not show appreciable change over 96–192 hours of culture in serum-containing media. All three lots followed the same pattern of change in CYP3A4 activity. Change in the basal activity of CYP2B6 following an induction assay in serum-free media was also monitored (Fig. 2B). The formation of hydroxybupropion remained consistent over the 7-day recovery period indicating that the HepatoPac cultures maintain metabolic activity for at least 2 weeks after receipt. Change in basal activity of CYP3A4 and CYP2B6 in HepatoPac cultures measured either with midazolam or bupropion as the substrate in three lots of hepatocytes. (A) and (B) show the change in CYP3A4 and CYP2B6 activity, respectively, following a 72-hour treatment with 0.1% DMSO in serum-free media. The x-axis represents time after a 72-hour treatment with 0.1% DMSO. Data are shown as mean (S.D.) of three independent determinations. Comparison of CYP3A4 Induction in HepatoPac Cultures and Hepatocyte Monocultures by Prototypical Inducers. Both HepatoPac and hepatocyte monocultures were treated with the prototypical inducers rifampin (0.001–10μM), phenytoin (1–200μM), and phenobarbital (10–1000 μM) for 72 hours and fold change in P450 activity and gene expression were determined. The dose response curves for activity and mRNA from the HepatoPac (Figs. 3 and 4) and from the hepatocyte monocultures (Figs. 5 and 6) were fitted to the sigmoidal Emax model. The EC50 for rifampin-mediated induction of CYP3A4 mRNA in the HepatoPac cultures was 0.09 μM in the three lots, and the EC50 in monocultures for CYP3A4 gene expression ranged from 0.24 to 1.2 μM in the three lots tested (Table 2). The EC50 values for phenytoin and phenobarbital-mediated induction of CYP3A4 gene expression ranged from 30 to 75 μM and 85 to 112 μM, respectively, in HepatoPac cultures. Overall, the Emax and EC50 for induction of CYP3A4 activity was in agreement with the mRNA data. Emax and EC50 for CYP3A4 activity and mRNA after treatment with rifampin, phenobarbital, and phenytoin for 72 hours in either HepatoPac or monocultures in serum-free media. Dose-response curves for CYP3A4, CYP2B6, CYP2C8, and CYP2C9 mRNA in HepatoPac following treatment with rifampin, phenobarbital, and phenytoin for 72 hours in three lots of hepatocytes. Graphs in rows A, B, C, and D show dose-response curves for CYP3A4, CYP2B6, CYP2C8, and CYP2C9, respectively. Data shown are means (S.D.) of three determinations in three lots of human hepatocytes. Dose-response curves for CYP3A4 (row A) and CYP2C9 (row B) activity in HepatoPac following a 72-hour treatment with rifampin, phenobarbital, and phenytoin in three lots of hepatocytes. Data shown are means (S.D.) of three independent determinations. Dose-response curves for CYP3A4, CYP2B6, and CYP2C8 mRNA in three lots of hepatocytes. Monocultures of hepatocytes were treated with rifampin, phenobarbital, and phenytoin for 72 hours. Rows A, B, and C show dose-response curves for CYP3A4, CYP2B6, and CYP2C8, respectively. Data shown are means (S.D.) of three independent determinations. Dose-response curves for change in CYP3A4 (row A) and CYP2C9 (row B) activity in hepatocyte monocultures following a 72-hour treatment with rifampin, phenobarbital, and phenytoin in three lots of hepatocytes. Data shown are means (S.D.) of three independent determinations. CYP2C9 and CYP2C8 Induction in HepatoPac and Monocultures of Hepatocytes. Preliminary studies (data not shown) showed that a 48-hour incubation time was insufficient to achieve significant induction of CYP2C9 mRNA. Hence we decided to employ a longer (72-hour) incubation period to assess the induction of all genes including CYP2C9. We compared the induction of CYP2C9 and CYP2C8 in the HepatoPac cultures to that in the monocultures following treatment with prototypical inducers. HepatoPac cultures showed a robust increase in CYP2C9 expression and activity following a 72-hour treatment with rifampin and phenobarbital (Figs. 3 and 4). Rifampin-mediated induction of CYP2C9 in HepatoPac showed an Emax of 3- to 4.5-fold for mRNA and 3- to 3.5-fold for activity (Table 3). The EC50 of rifampin in lot NON was about 10-fold lower in HepatoPac versus the monoculture. Phenobarbital caused about a 3-fold change in mRNA of CYP2C9 and about 6- to 7-fold increase in activity of CYP2C9. 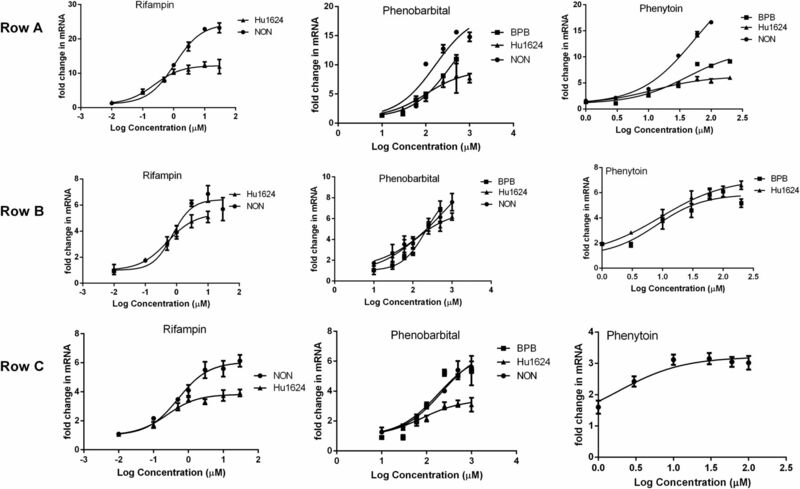 Rifampin and phenobarbital caused only a modest change in CYP2C9 expression and activity in monocultures of hepatocytes. The fold response in CYP2C9 by rifampin and phenobarbital in the hepatocyte monocultures was often below the threshold and could not be fit to a sigmoidal Emax model (5 and 6). Phenytoin did not cause an increase in CYP2C9 mRNA or activity in both the HepatoPac and the hepatocyte monocultures. The Emax for induction of CYP2C8 mRNA by rifampin and phenobarbital was 2- to 3-fold higher in the HepatoPac than in monocultures of hepatocytes in lots BPB and NON (Table 4). The Emax in lot Hu1624 was higher for rifampin but similar for phenobarbital in the HepatoPac model than in monocultures. Phenytoin did not show a robust inductive response for CYP2C8 in Hu1624 and BPB lots in the hepatocyte monocultures. Phenytoin did cause induction of CYP2C8 gene in monocultures of lot NON; however, the dose-response curve was not robust, and hence could not be fit to a sigmoidal Emax model. Emax and EC50 for CYP2C9 activity and mRNA after treatment with rifampin, phenobarbital, and phenytoin for 72 hours in either HepatoPac or monocultures in serum-free media. Emax and EC50 for CYP2C8 mRNA after treatment with rifampin, phenobarbital, and phenytoin for 72 hours in either HepatoPac or monocultures in serum-free media. Induction of CYP2B6 Expression in HepatoPac and Hepatocyte Monocultures. Induction of CYP2B6 expression was evaluated in both culture models. In both models, all compounds tested showed robust CYP2B6 expression in a concentration-dependent manner (Figs. 3 and 5). Induction of CYP2B6 was either similar to or about 2-fold greater in HepatoPac cultures than in the monoculture model. Phenobarbital and phenytoin showed higher Emax than did rifampin in the HepatoPac cultures; however, the Emax values were similar for all three compounds in the monocultures (Table 5). Degradation kinetics of CYP3A4 and CYP2B6 protein. Emax and EC50 for CYP2B6 mRNA after treatment with rifampin, phenobarbital, and phenytoin for 72 hours in either HepatoPac or monocultures in serum-free media. In this experiment, HepatoPac cultures were first treated with either 0.1% DMSO or 10 μM rifampin in serum-free–induction media for 72 hours to induce CYP3A4 and CYP2B6 protein and mRNA. The cultures were maintained in the serum-containing media after the 72 hours of drug treatment to avoid the loss of activity that occurs when treatment in serum-free media is prolonged. The fold change in activity and message were measured at several time points following the 72-hour inductive period. At 0 hours after treatment with rifampin, CYP3A4 activity was induced 6- to 10-fold and the mRNA was induced about 7- to 11-fold in three lots. CYP2B6 activity and mRNA were also induced in two hepatocyte lots following treatment with 10 μM rifampin. The loss of activity and mRNA was plotted against time and the data were fitted to a linear regression model (Fig. 7 and 8). The slope of the line was then used to calculate the half-life (t1/2). The t1/2 of CYP3A4 protein was determined to be 43–56 hours and that for CYP3A4 mRNA was 21–31 hours (Table 6). The degradation t1/2 for CYP2B6 protein was 70 hours and that for mRNA was 36–40 hours in the two lots (Table 7). These data show that mRNA has a shorter t1/2 than the protein for both P450s. The t1/2 values for both functional protein and mRNA showed minimal interdonor variability. The expression of CYP2D6 in rifampin-treated and vehicle-treated cells was determined as a negative control in the kdeg experiments. The ΔCT values of CYP2D6 in all treatments remained consistent over the recovery phase of the experiment (7 days). The fold change in CYP2D6 in rifampin-treated cells compared with the vehicle-treated cells was close to unity at all the time points in the study. These data indicate that the change in the expression of inducible genes such as CYP3A4 and CYP2B6 in the HepatoPac system is not an artifact of the in vitro model. 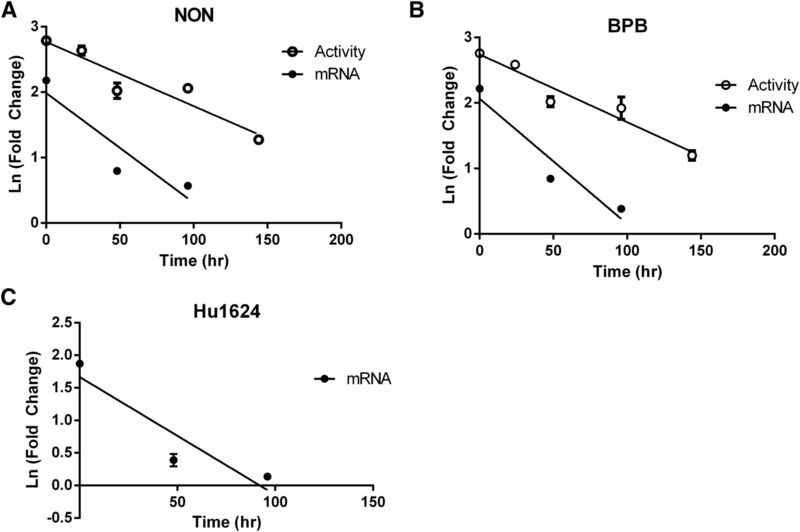 Kinetics of degradation of CYP3A4 protein and mRNA in three lots of human hepatocytes. HepatoPac cultures were treated with 10 μM rifampin for 72 hours, and the recovery of CYP3A4 activity and mRNA to baseline was measured. All assays were run triplicate. Open circles (○) represent CYP3A4 activity and filled circles (●) represent CYP3A4 mRNA. Data shown are means (S.D.) of three determinations. The data were fit to linear regression, and slope was used to calculate half-life of CYP3A4 protein and mRNA. Solid lines show the regression fit. 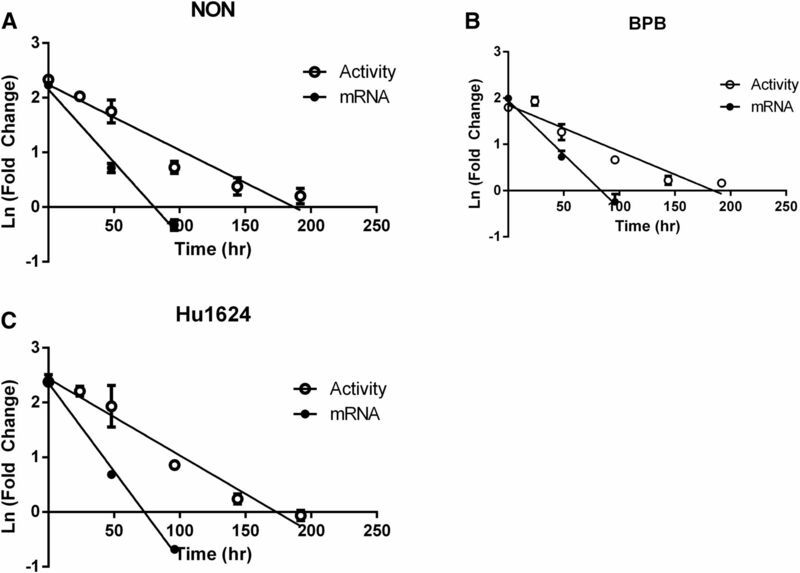 Degradation kinetics of CYP2B6 mRNA and protein in three lots of human hepatocytes. HepatoPac cultures were treated with 10 μM rifampin for 72 hours and fold change in CYP2B6 activity and mRNA were measured over a recovery period of 7 days. All assays were run in triplicate. The open circles (○) represent CYP2B6 activity and filled circles (●) represent CYP2B6 mRNA. Data shown are means (S.D.) of three determinations. The data were fit to linear regression and the resulting slope was used to calculate t1/2 and kdeg. Solid lines show the regression fit. kdeg and t1/2 of CYP3A4 protein and mRNA in three lots of human hepatocytes after induction with 10 μM rifampin for 72 hours. Fold change in CYP3A4 activity or mRNA over DMSO control was monitored for 7days. Data were fitted to linear regression and the slope of the line was converted to the half-life. Data are shown as the mean (S.E.) of three independent determinations. kdeg and t1/2 of CYP2B6 mRNA and functional protein in three lots of human hepatocytes after induction with 10 μM rifampin for 72 hours. Fold change in CYP2B6 activity or mRNA over DMSO control was monitored for 7days. In Vivo EC50 for Rifampin. PBPK modeling using Simcyp was used to predict the free steady-state Cmax of rifampin after oral dosing. The simulated Cmax of rifampin at the 600-mg dose is similar to reported clinical Cmax of rifampin at 600 mg (Garg et al., 2013). The change in midazolam AUC after treatment with varying oral doses of rifampin was reported in Kharasch et al. (2011). 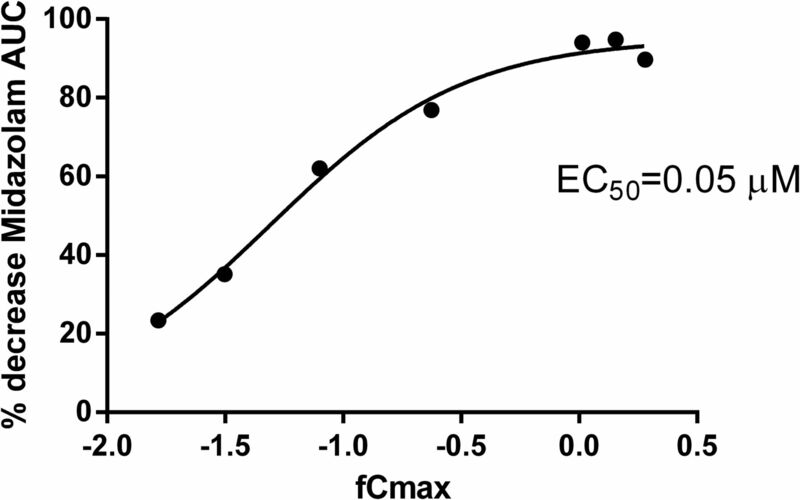 The correlation between the midazolam AUC change and the predicted free Cmax of rifampin shows that the in vivo EC50 for rifampin is 0.05 μM (Fig. 9). Correlation between the predicted clinical Cmax of rifampin and the decrease in midazolam exposure. The clinical exposure was simulated using the Simcyp default model and parameters for rifampin. Unbound Cmax and the change in midazolam AUC were fitted to the sigmoidal Emax curve using GraphPad Prism. The apparent potency (EC50) of rifampin using these data are predicted to be 0.05 μM. The concentration of rifampin was measured in the media after incubation with murine fibroblasts. Figure 10 shows the % change in rifampin over the incubation period. Rifampin was also incubated in induction media with monocultured human hepatocytes at 4°C to prevent compound loss from metabolism. In both systems the change in the concentration of rifampin was less than 25% from the nominal, indicating minimal nonspecific binding of the compound to either cell type. Nonspecific binding of rifampin (1 μM) to murine fibroblasts or human hepatocytes. Rifampin was incubated with fibroblasts or hepatocytes in induction media at 37°C or 4°C, respectively. The change in concentration of rifampin is presented as % change from nominal. Data are shown as a mean ± S.D. (n = 3). In the current work we report a comparative analysis of inductive response between the HepatoPac model and monocultured models as well as the relative expression of several metabolic enzymes, transporters, and transcription factors in the two culture models using the same donors of cryopreserved hepatocytes. The magnitude and the potency of inductive response in the HepatoPac cultures are in agreement with those observed in the monocultures, albeit with some exceptions. The HepatoPac model appears to be more sensitive to rifampin, as was observed by the shift in the potency of rifampin in HepatoPac versus monocultures. In lots NON and BPB, but not in Hu1624, the EC50 of rifampin for CYP3A4 was about 10-fold lower in HepatoPac, thus displaying an equal or greater sensitivity to the PXR agonist. Data from our laboratory and from others (Zhang et al., 2014) have shown that the EC50 of rifampin in monocultured or in sandwich-cultured hepatocytes is in the range of 0.5–1 μM. Rifampin showed minimal nonspecific binding to media or to cells in the monoculture or in the coculture format (Fig. 10), indicating that the shift in EC50 cannot be attributed to change in the free fraction. Clinical data shows that rifampin can cause significant DDI with midazolam at doses as low as 5 mg/day given for 5 days (Kharasch et al., 2011). We used the rifampin model in the Simcyp simulator to predict free plasma concentrations of rifampin at the doses used in the study. The fCmax was correlated with the decrease in the midazolam AUC using a sigmoidal Emax model (Fig. 9). The correlation shows that the apparent clinical EC50 of rifampin could be as low as 0.05 μM. These analyses suggest that HepatoPac may be a more sensitive model than monocultured hepatocytes for estimating the potency of rifampin. Future studies that include incubation time longer than the traditional 48–72 hours could be useful to determine the inductive potential of weaker inducers. However, it is essential to understand any changes in the metabolic activity after prolonged exposure to serum-free media. The potency of rifampin could be influenced by the differences in the activity and the expression of transporters in the two culture models. Rifampin is a substrate as well as an inhibitor of OATP1B1 (Hirano et al., 2006; Niemi et al., 2006). It was shown by Tirona et al. (2003) that PXR activation occurs at lower rifampin concentrations in OATP1B1-expressing cells compared with those that are OATP1B1-naïve. We found that the expression of OATP1B1 in the HepatoPac model is not significantly different from that in monocultures. However, the expression of OATP1B3, which is involved in rifampin disposition (Yamaguchi et al., 2011), was higher in HepatoPac cultures. Studies have shown that hepatocytes cultured for 7 days showed higher OATP1B3 activity (Zhu et al., 2014). Interestingly, expression of OATP1B3 was only higher in lots BPB and NON and not in Hu1624. This corresponds to the observation that the EC50 of rifampin was shifted in BPB and NON but not in Hu1624. Further investigations with clinical inducers that are substrates of uptake transporters are currently being conducted in our laboratory. The HepatoPac model also showed induction of a CAR-responsive gene, CYP2B6. All three inducers showed a robust increase in the gene expression of CYP2B6 in both culture models. The potency of rifampin in lot NON was about 2-fold lower for this gene in HepatoPac. CYP2B6 is preferentially regulated by hCAR (Faucette et al., 2006), whereas rifampin preferentially activates PXR (Faucette et al., 2007). The lack of a more significant shift in potency for CYP2B6 induction by rifampin could result from its activation of only one regulatory pathway. Determining an Emax and EC50 for CYP2C9 in hepatocyte-induction assays is challenging since the magnitude of response is often close to or below the threshold (Yajima et al., 2014). We attempted to use the HepatoPac model to derive a dose-response relationship for CYP2C9 with prototypical inducers. The HepatoPac cultures show a higher and consistent response for both of the CYP2C genes compared with the monocultures. In the HepatoPac model we observed that a 3.5-fold change in mRNA and up to a 7-fold change in activity with phenobarbital, a dual PXR/CAR transactivator (Sahi et al., 2009). Phenobarbital showed the highest inductive response for CYP2C9 expression and activity in the HepatoPac model, perhaps owing to its dual activation of PXR and CAR. Phenytoin, a preferential hCAR transactivator (Küblbeck et al., 2011) failed to significantly increase CYP2C9 mRNA or activity in either culture model. A previous report by Sahi et al. (2009) has also shown that phenytoin does not induce CYP2C9. Although the dynamic range of the inductive response is not as large as that for other P450 enzymes, these data suggest that HepatoPac can be a useful tool to assess CYP2C9 induction for compounds with complex DDIs, such as ritonavir. Ritonavir shows clinically significant induction of warfarin clearance (Knoell et al., 1998); however, this induction of CYP2C9 is not adequately captured in vitro (Dixit et al., 2007). CYP2C8 induction has been quantified by several researchers, but the inductive response was inconsistent in different donors. In the HepatoPac cultures, CYP2C8 was inducible in all the lots and by all the inducers used in the current work. However, in the monocultures CYP2C8 gene was inducible by phenytoin in only one out of the three lots tested. CYP2C8 is regulated by multiple receptors including both PXR and CAR (Chen and Goldstein, 2009). Hence the reasons behind the lack of induction of CYP2C8 by phenytoin in monocultures are unclear. Accurate estimation of degradation rates of P450 enzymes is essential for improved prediction of induction- and inhibition-based drug interactions. We harnessed the longevity of the HepatoPac cultures so as to allow measurement of the depletion kinetics of both mRNA and protein function following an induction period. Maintaining the cultures in serum-containing media during the recovery phase allowed us to retain the basal activity (Fig. 2) and follow the recovery of enzyme back to baseline. Having used this technique, we report the average degradation t1/2 of the CYP3A4 mRNA to be 26 hours and that of protein to be 49 hours. To understand if the half-life of PXR- and CAR-regulated P450s could be different, we also investigated the t1/2 of CYP2B6. The half-life of CYP2B6 mRNA (38 hours) appears to be longer than that of CYP3A4. The depletion kinetics of CYP2B6 protein as measured by functional activity was ∼70 hours, which is longer than that for CYP3A4, indicating differential kinetics. The reason behind these differences in half-lives of different P450s is currently unclear. The Simcyp PBPK model uses 32 hours as the t1/2 of CYP2B6 in the liver, which was measured using immunoreactive CYP2B6 in liver slices from a single donor (Renwick et al., 2000). The turnover rate reported here could prove useful for development of better PBPK models aimed at predicting DDI attributable to induction, inactivation, or suppression of CYP2B6. Several clinical studies have attempted to establish a kdeg for CYP3A4. A clinical study with rifampin as the inducer studied the depletion kinetics of CYP3A4 using midazolam as a probe for CYP3A4 (Reitman et al., 2011). The half-life of CYP3A4 protein from this study was suggested to be 7.7 days. This is longer than that reported in our in vitro study and can be explained by insufficient time points in the clinical study. However, studies with other inducers, such as St. Johns Wort (Imai et al., 2008), carbamazepine (Magnusson et al., 2008), and methadone (Yang et al., 2008), have reported half-lives more akin to that observed in the current study. The change in urinary 6β-hydroxycortisol-to-cortisol ratio has also been used to define the t1/2 and was reported to be 3 days (Yang et al., 2008). Recently, Ramsden et al. (2015) used the HepatoPac cultures to determine the kdeg of CYP3A4 protein using small-interfering RNA and interleukin 6 knockdown of the gene. This study reported the half-life of CYP3A4 protein in the range of 22–39 hours, which is similar to that reported here. However, in the study by Ramsden et al., the t1/2 of CYP3A4 mRNA was not obtained by direct measurement in all the donors and was estimated by modeling the enzyme recovery data. Since the degradation rate of protein or mRNA is considered a system parameter for PBPK modeling, accurate measurement of this parameter is essential for DDI predictions. Finally, this report shows the utility of hepatocyte cocultures for determining the induction potential of several drug-metabolizing P450s. Long-term coculture models maintain the functionality of drug transporters and metabolic enzymes, which are important determinants of intracellular drug concentrations. In spite of these advantages, challenges such as low throughput and high cost makes the HepatoPac model less desirable than monoculture models for routine assessment of DDI. Overall, we demonstrate that this model can be used to perform extended drug treatments that could include an induction/inactivation and recovery periods to evaluate complex DDI. Participated in research design: Dixit, Hariparsad, Moore. Conducted experiments: Dixit, Moore, Tsao. Performed data analysis: Dixit, Moore. Wrote or contributed to the writing of the manuscript: Dixit, Hariparsad, Moore. Amanda Moore is a former employee of Hepregen Corporation and owns equity in that company. This article has supplemental material available at dmd.aspetjournals.org. (2015) 3D Cultivation Techniques for Primary Human Hepatocytes. Microarrays 4:64–83. (1996) Effect of extracellular matrix topology on cell structure, function, and physiological responsiveness: hepatocytes cultured in a sandwich configuration. FASEB J 10:1471–1484. (2010) Matrix elasticity, cytoskeletal forces and physics of the nucleus: how deeply do cells ‘feel’ outside and in? J Cell Sci 123:297–308. (2013) Meeting the challenge of predicting hepatic clearance of compounds slowly metabolized by cytochrome P450 using a novel hepatocyte model, HepatoPac. Drug Metab Dispos 41:2024–2032. (2009) The transcriptional regulation of the human CYP2C genes. Curr Drug Metab 10:567–578. (2007) Cytochrome P450 enzymes and transporters induced by anti-human immunodeficiency virus protease inhibitors in human hepatocytes: implications for predicting clinical drug interactions. Drug Metab Dispos 35:1853–1859. (2014) Evaluation of various static and dynamic modeling methods to predict clinical CYP3A induction using in vitro CYP3A4 mRNA induction data. Clin Pharmacol Ther 95:179–188. (2010) Cytochrome P450 3A4 mRNA is a more reliable marker than CYP3A4 activity for detecting pregnane X receptor-activated induction of drug-metabolizing enzymes. Drug Metab Dispos 38:1605–1611. (2006) Differential regulation of hepatic CYP2B6 and CYP3A4 genes by constitutive androstane receptor but not pregnane X receptor. J Pharmacol Exp Ther 317:1200–1209. (2007) Relative activation of human pregnane X receptor versus constitutive androstane receptor defines distinct classes of CYP2B6 and CYP3A4 inducers. J Pharmacol Exp Ther 320:72–80. (2013) The effect of CYP3A inhibitors and inducers on the pharmacokinetics of telaprevir in healthy volunteers. Br J Clin Pharmacol 75:431–439. (2001) Clinical relevance of genetic polymorphisms in the human CYP2C subfamily. Br J Clin Pharmacol 52:349–355. (1998) Long-term expression of differentiated functions in hepatocytes cultured in three-dimensional collagen matrix. J Cell Physiol 177:553–562. (2006) Drug-drug interaction between pitavastatin and various drugs via OATP1B1. Drug Metab Dispos 34:1229–1236. (2008) The recovery time-course of CYP3A after induction by St John’s wort administration. Br J Clin Pharmacol 65:701–707. (1994) Fluorescence in situ hybridization analysis of chromosomal localization of three human cytochrome P450 2C genes (CYP2C8, 2C9, and 2C10) at 10q24.1. Jpn J Hum Genet 39:337–343. (2011) Sensitivity of intravenous and oral alfentanil and pupillary miosis as minimal and noninvasive probes for hepatic and first-pass CYP3A induction. Clin Pharmacol Ther 90:100–108. (2008) Microscale culture of human liver cells for drug development. Nat Biotechnol 26:120–126. (1998) Potential interaction involving warfarin and ritonavir. Ann Pharmacother 32:1299–1302. (2011) New in vitro tools to study human constitutive androstane receptor (CAR) biology: discovery and comparison of human CAR inverse agonists. Mol Pharm 8:2424–2433. (2008) Pharmacodynamics of carbamazepine-mediated induction of CYP3A4, CYP1A2, and Pgp as assessed by probe substrates midazolam, caffeine, and digoxin. Clin Pharmacol Ther 84:52–62. (2011) Human arylacetamide deacetylase is responsible for deacetylation of rifamycins: rifampicin, rifabutin, and rifapentine. Biochem Pharmacol 82:1747–1756. (2006) Effect of SLCO1B1 polymorphism on induction of CYP3A4 by rifampicin. Pharmacogenet Genomics 16:565–568. (2014) Generating an in vitro-in vivo correlation for metabolism and liver enrichment of a hepatitis C virus drug, faldaprevir, using a rat hepatocyte model (HepatoPac). Drug Metab Dispos 42:407–414. (2015) Determination of a Degradation Constant for CYP3A4 by Direct Suppression of mRNA in a Novel Human Hepatocyte Model, HepatoPac. Drug Metab Dispos 43:1307–1315. (2011) Rifampin’s acute inhibitory and chronic inductive drug interactions: experimental and model-based approaches to drug-drug interaction trial design. Clin Pharmacol Ther 89:234–242. (2000) Differential maintenance of cytochrome P450 enzymes in cultured precision-cut human liver slices. Drug Metab Dispos 28:1202–1209. (2009) Regulation of cytochrome P450 2C9 expression in primary cultures of human hepatocytes. J Biochem Mol Toxicol 23:43–58. (2003) Human organic anion transporting polypeptide-C (SLC21A6) is a major determinant of rifampin-mediated pregnane X receptor activation. J Pharmacol Exp Ther 304:223–228. (2014) A micropatterned hepatocyte coculture model for assessment of liver toxicity using high-content imaging analysis. Assay Drug Dev Technol 12:16–27. (2010) Assessment of a micropatterned hepatocyte coculture system to generate major human excretory and circulating drug metabolites. Drug Metab Dispos 38:1900–1905. (2014) Evaluation of 23 lots of commercially available cryopreserved hepatocytes for induction assays of human cytochromes P450. Drug Metab Dispos 42:867–871. (2011) Screening of antibiotics that interact with organic anion-transporting polypeptides 1B1 and 1B3 using fluorescent probes. Biol Pharm Bull 34:389–395. (2008) Cytochrome p450 turnover: regulation of synthesis and degradation, methods for determining rates, and implications for the prediction of drug interactions. Curr Drug Metab 9:384–394. (2014) Investigational small-molecule drug selectively suppresses constitutive CYP2B6 activity at the gene transcription level: physiologically based pharmacokinetic model assessment of clinical drug interaction risk. Drug Metab Dispos 42:1008–1015. (2014) Evaluation of calibration curve-based approaches to predict clinical inducers and noninducers of CYP3A4 with plated human hepatocytes. Drug Metab Dispos 42:1379–1391. (2014) Culture duration-, donor-, and medium-dependent changes in OATP1B3-mediated telmisartan uptake in human hepatocytes. Drug Metab Lett 7:117–125.